Those little hidden ristorantes in Italy beckon, but they are not so very far away. Walk into Pianeta Ristorante in Truckee’s old Commercial Row area downtown, and you are there! Owners Robyn Sills and Ed Coleman have painstakingly created a fresco-laden, welcoming and wine-loving place right here in Tahoe. With more than 50 years of experience in fine dining between them, Robyn and Ed have worked to coordinate wine and food in Pianeta to create an evening that’s unrushed and fun. Their extensive wine list, which has been cited as one of the area’s best, features (of course) many Italian wines. One of those good Italian wines on their list is La Vis Pinot Grigio, from the Trentino region of Italy. This wine is delicious, with bright fruit flavor, a soft floral aroma augmented by a bit of spice, and as it opens up in your glass, you can taste tangerine, almond, apricot and citrus on the finish. $7/glass. There are several good food pairings on the Pianeta menu, and all of them went well with this Pinot Grigio – bruschetta, olive tapenade with goat cheese on toast triangles, and a caprese served on a pool of fresh basil and olive oil. If those pairings intrigue you, try an Italian red wine with them too. The Ciacci Piccolomini d’Aragona, an Italian Chianti, is aromatic with tones of cherry, and features soft tannins on the finish. Not so earthy as many Tuscan wines, and medium acidity made it a great food wine. The Tormaresca “Neprica” is a blend of Cabernet (30%), Primitivo (30%) and Negromaro (40%) and it is a hidden gem indeed! At $7 the glass, it paired fantastically well with the carpaccio, and the house-made Salcica served on poleta with roasted pepper. Often called a Super Tuscan, this wine is rich and complex, is well balanced with lots of fruit, and a nice structure with medium tannin. 13.5% alcohol. The house made pasta dishes at Pianeta are many, and all of them are fabulous. There is a daily special ravioli that is always excellent, Good wine pairings from the Pianeta wine list are many, but two good ones are the 2005 Leonetti Sangiovese and the 2007AntinoriBianco. The Leonetti hails from Walla Walla, WA, and is a blend of 76% Sangiovese, 13% Syrah, 11% Cabernet. It is a bright ruby red, and the aroma is redolent of red currant, berry, spice. Taste carries the spice through with some floral tones. On the finish, a hint of sweetness, chocolate. A nice acidity. The 2007 AntinoriBianco is in Pianeta’s “More Adventurous Whites” section on the wine list, and it is a lovely Tuscan white. It is crisp, a blend of four grapes, dry and yet the tropical fruit overtones lead to a very enjoyable wine with medium finish and a citrusy aftertaste. The favorite wine/food pairing of the owner? Ed would sit down anytime to their ribeye steak, topped with gorgonzola cheese & balsamic grilled onions. His wine choice is the 2005 Avignonese, Vino Nobile di Montepulciano, which Wine Spectator awarded 92 points. A beautiful garnet red in color; it’s intense in flavor, a teasing scent of violet, and dry taste of black cherry and licorice, with a hint of tannin. It’s perfect for serving now, and Ed likes its understated style and good balance. Pianeta Ristorante is located at 10096 Donner Pass Rd, Truckee, CA 96161. (530) 587-4694. Try their daily special pasta! What oh What to Pair With Chocolate? TAHOE Festival Answers This Important Question! The Chocolate, Wine and Roses Festival, held in November 2009, answers the important question for wine aficionados and chocolate lovers: what wines to pair in order to extend the sumptuousness of chocolate. This event is another instance of the do-good, taste-wine, eat-well opportunities that Tahoe neighbors and visitors can experience each year at the lake. Benefitting Tahoe Women’s Services and Project MANA, the Festival held at the North Tahoe Event Center, Kings Beach, should go on your calendar next autumn. Ta-Dum! A new winery debuts at this Festival – the Big Woody Wine Company, located in Incline Village at sailing coordinates 39° N, 120° W. Alan Richards, president (who owns a goodsized vintage wooden Chris Craft boat, thus the winery’s name) poured his 2006 Cabernet Sauvignon, sourced from Lake County. This is similar to a vin de pays from the Southern Rhone, with the raisinated fruit of a village wine. 13.7% alcohol. $15/bottle. The 2007 Chardonnay from Sonoma is akin to southern-Rhone white - think Granache Blanc/Viognier with some floral aromatics and backbone to stand up to foods. 13.0% alcohol. $15/bottle. The Big Woody wines were wonderfully paired with a dozen different chocolates hand made by Aaron Zendner, chocolatier extraordinaire of Mr. Z’s Micro-confectionary, based in Incline Village. My favorite of Aaron’s array was an amazing chocolate covered toffee sprinkled with chopped nuts. This is NOT for the calorie-conscious. Truckee River Winery, which has just opened a tasting room, has expanded its offerings. They poured their 2008 El Dorado County Pinot Gris, very flavorful , an unfiltered wine with the characteristic Pinot Gris coming through nicely, with a crisp finish, 13.4% $12/bottle. This wine was awarded the People’s Choice Award at the Chocolate-Wine-Roses Festival. On the way to taste the wines presented by Joseph Nase of Moody’s/Baxter’s Northstar, we took time to watch Brooke and Thomas McCarthy, owners of Bite Catering of Incline Village, put together a wonderful Choco Taco, comprised of a slice of ripe persimmon, topped with house made Ghiradelli Fudge and finished with pomegranate and fresh fruit tidbits. This could be a difficult pairing to make, but Nase recommended two very different wines, both of which went beautifully. The 2007 Banyuls by M Chapoutier is a classic with chocolate. Somewhat prun-ey in the nose, but then delights the palate with raisins, nuttiness, molasses, black raspberry. Made from very old Grenache vines, 16% alcohol. About $20 for a 500 ml bottle. The second wine, a Lot XIII Charles Krug Napa Valley Zinfandel Port is a limited release wine that presents a toffee-delight to the nose and carries through in taste. There are oak aromatics at play here too, and berry jam. “Crafted in the spirit of the Solera style, thirteen vintages create a seductive history of our Port in one glass,” notes the Krug website. “This elegant and weighty Port lingers on the palate, slowly drifting to a chewy, yet supple finish.” Yes it does. It is a delight with chocolate. 18.1% alcohol, $35 for a 375 ml bottle. Dawn Bertsch, one of our favorite young sommeliers in the Lake Tahoe area, poured two wonderful chocolate-pairing wines on behalf of Chambers & Chambers Wine Merchants. Dr Loosen 2007 Riesling Kabinett is not only a great aperitif wine, but a dinner wine due to a fine lingering aftertaste and a spicy, tangy minerality. It’s low alcohol, 8.5%, makes it very refreshing . $20/bottle. The Cossart Gordon Madeira Bual was aged 15 years in Oak, to reach its 19% alcohol level it is an inviting wine, fruity, and with well rounded fruit, touch of cinnamon, and a lasting finish. $38/ 500 ml bottle. Although it will be another year before this benefit is held, please remember that these charitable organizations deserve and need your support year-round. For more information on dining and the wide range of activities around Lake Tahoe, see the online version of The Tahoe Weekly. This article appeared in my column "It's Grape" in November 2009. It will pay to sit up straight and think about this quote : "Defining a new normal and acting on that is more prudent than waiting for the old normal to return." That's a note from Rob McMillan, founder of Silicon Valley Bank's Wine Division and author of their Annual State of the Wine Industry Report. Of all the prelims, this is the most important lesson. I haven't been blogging a lot this year, because the paradigm shift initiated by the current recessionary economic environment has been confusing to all. I've been hesitant to write about the old order and best business practices to maintain that order, and it just hasn't seemed appropriate to be a booster of techniques and terms of the "old normal". Now, my prognosis is that the shake out is almost done. The owners of cult wineries fueled by the excess money earned in Silicon Valley are twisting and turning and trying to survive, and these wannabe winmakers have learned -- or should have learned -- that their $120 cabs and $80 chards are just not going to sell beyond their own personal rolodexs. The big guys got bigger (Foley, an excellent example) by buying low and smartly are using the synergies that come from centralizing management functions to reduce G&A and other fixed costs and stay profitable. So maybe 2010 will bring some structure to the industry, and the "new normal" -- yet to be defined and quantified -- will provide grist for the blogger mill once again. I'm really looking forward to the Unified Symposium to schmooze and get the skivvy. One of the nice things about survival mode, I've observed, is that the best and brightest people are more willing to share... or at least to drop a few veils. "In early 2008 the Virginia Tech wine department organized a very successful Winery Sustainability and Design program covering many winery sustainability issues. Because of the success of this event and the importance of the subject, Dr. Bruce Zoecklein posted an Adobe Presenter version of this Online. Each presentation is approximately 45 minutes long. Topics are discussed by some of the most respected winery architects, engineers, and winery planners from California and the Pacific Northwest. This password-protected program is available for a donation of $45 to the Enology-Grape Chemistry Group at Virginia Tech. These funds will be used to support graduate student education. 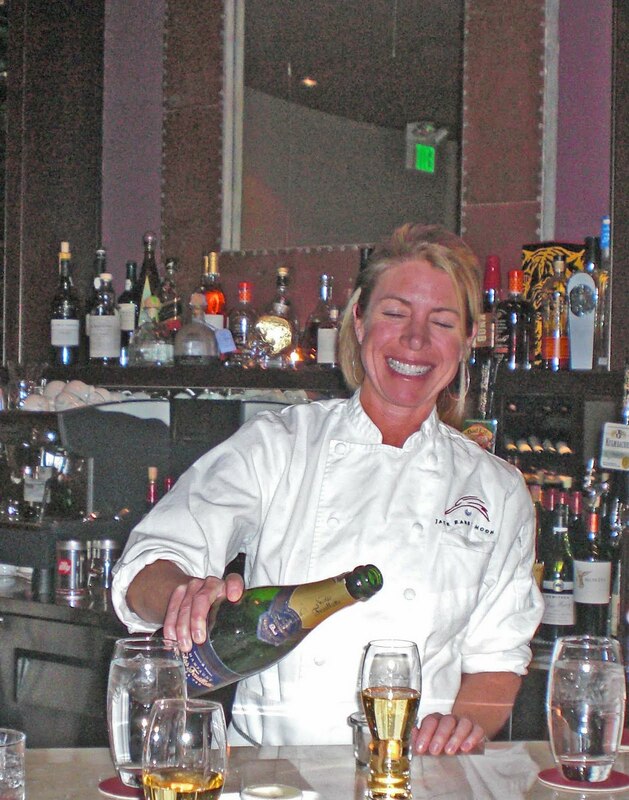 Check it out at: http://www.vtwines.info/ "
One of the most talented sommeliers at Lake Tahoe is Kristi Snyder, who buys wine and makes diners feel very welcome at the fantastic lakeside Lone Eagle Grill at Hyatt Regency Incline. She's the kind of wine professional who you just want to visit time and again. No wonder this is the highest ranking Hyatt in the world in terms of bottle sales of wine! Kristi pulls everyone together in a spirit of education, fun and food. Today's treat (November 10, 2009) was happening onto a tasting of Opolo wines, and 7 bottles of wonder from this Paso Robles vineyard and winery were open and being gently paired with the Grill's great cuisine. "We've become known as a Zinfandel house," said Cary Thrasher, Sales Manager of Opolo Vineyards. He was pouring their 2007 Mountain Zinfandel. No sense in mincing words, this is a fantastic wine, a great value at $2 8 per bottle, and there's a good chance you will find it on the Hyatt Incline's wine list soon. The Opolo website description says it all: "Always an Opolo favorite, we are particularly proud of this wine. Possibly the best vintage yet, the '07 Mountain Zinfandel is loaded with gobs of boysenberry, wild cherry and blackberry. Rustic anise and ripe velvety tannins on the finish are the perfect ending to this fantastic wine." Regardless of the Zin-house reputation, Nevada sales rep Gabri Fogliani of Encore Beverages encouraged me to try the Opolo 2006 Viognier. It is absolutely wonderful. Grapes come from 300 acres that Opolo has in Paso Robles. It's big-bodied, tones of apricot and melon and a bit of spice, and it has a great long and rich finish. 14.9% alcohol, $22.00 a bottle. Frankly, the Viognier is one of the best wines I've tasted since I started writing the weekly wine column for The Tahoe Weekly newspaper in April 2009. That says a lot -- it's been almost 1000 wines. Might be the perfect wine for your Thanksgiving feast! Staff up your tasting room on Saturdays! This is one lesson to be gleaned from a recent survey from the MidWest wine industry, in this instance Nebraska. The results are courtesy of Iowa State's Michael L White. who produces a fantastic bi-weekly newsletter called Wine-Grower-News. In issue #106 November 6, 2009, Mike shared a news item that should help wineries who particiate in wine trail programs better understand consumer behavior. "The Nebraska Winery and Grape Growers Association (NWGGA) has a great newsletter called the NWGGA Juice. The August, 2009 edition has a good article that summarizes the mid-point survey of their Nebraska Wine Tour Passport program. Much of this information can be of value to other wine trail programs and/or events being planned here in the Midwest. These are the highlights of the mid-point consumer survey they completed using the Online Survey Monkey . - Only 9% of the responders felt that they would visit all 28 stops. Time and travel costs were issues. and they like the adventure and travel across Nebraska. - Only 9% participated in the Passport program for the wine bucks. - Saturday was the 100% top answer for the day they most likely would visit a Passport location. Sunday was second with 36.4%. - A tie for the number of visits per outing at 36.4% indicated visitors both choose 1-2 and 3-4 stops. - 72.7% said they travel more than 50 miles in a single Passport outing. - 90% knew that tasting rooms are different from wineries. - 72.7% appreciate the ability to taste wines from several wineries when visiting a tasting room. 36.4% enjoyed the ambiance of the tasting room. - Ambiance, friendly staff and good hospitality are key to a good experience. - 90.9% of the respondents wanted to learn more about the Nebraska wine industry. - 81.8% would consider a social membership with a fee around $10 per year being most popular. they are easier to find. 54% say they buy other wine because of price. - 45.5% did not know that many wineries have gift shops online that they can order from. - 100% said they will do the Passport again in 2010. - 50% thought tourist sites would be an interesting option to include. It would be difficult to find a better host for a winemaker dinner than Joseph Nase, Director of Wines at Baxter’s Bistro, Northstar-at-Tahoe. The winemaker dinner series he hosts are justifiably famous and packed with patrons, and Chef de Cuisine Michael Plapp contributes outstanding dishes for pairings with wines at the dinner. I attended the winemaker dinner that featured the wines of Kermit Lynch, a famous purveyor of the wines of Burgundy, with a shop located in Berkeley and sales offices nationwide. Mr Lynch has been named Wine professional of the Year by the James Bearch Foundation, and has been given medals by the government of France, including the Chevalier de la Legion d’Honneur. His book, Adventures on the Wine Route, is award-winning. The dinner began with Local Oysters Three Ways (broiled, smoked, raw), paired with a 2007 Aligote, Bouzeron, A & P De Villaine. This is a high acid white wine featuring Aligote, another white grape that’s used to make dry white wines in the Burgundy region of France. The most famous white grape from Burgundy is chardonnay. The next wine pairings were matched to the first course, a Clover Farms Rabbit Dijonnaise served with escargot and with Gary Romano’s Baby Carrots. (Gary Romano is an organic farmer producing wonderful produce in the Placerville area). The 2007 Morgan, Cru Beaujolais, Breton, was almost aromatic, hints of cardamom. The second wine, a 2007 Cote de Brouilly, Cru Beaujolais, Chateau Thivin, is a high acid wine, with bright fruit. It is terrific with food, and would match well with fish too. Taste of tobacco, pepper, black cherry. According to Mr. Ledbetter, this wine is a great value at about $19/bottle, so search for it! The third course, a Muscovy duck breast served with Romano’s Russian Kale, beluga lentils, Foie-shallot soubis sauce, was paired with two wines, both of them dark and spicy for the perfect accompaniment to this rich dish. The 2006 Nuit-St.-Georges, Premier Cru, Bousselots, Chevillon was the first wine, and the 2006 Gevrey-Chambertin, Premier Cru, Cherbaudes, Domaine Lucien Boillot was surprisingly mellow; it is often a very powerful wine. Finishing up the wine-food pairing was the dessert course, Champagne Grape Clafouti, paired with a low alcohol (7%) Vin due Bugey-Cerdon, La Cueille, Patrick Bottex. A lovely beginning to this over-the-top evening was a short seminar that Joseph Nase and Stephen Ledbetter gave on Chablis. We tasted four wonderful Chablis…. But we are out of space! Look for the next winemaker dinner series at Baxter’s at Northstar, listed on Northstar’s website http://www.northstarattahoe.com/. Or call (530) 543-3132 for information. To obtain any of the wines mentioned above, or other burgundian wines, contact Kermit Lynch via their website (http://www.kermitlynch.com/) or call their Berkeley location at 510 524 1524. In the world of wine, what could be grander than a Grand Tasting? The culmination of the Autumn Food & Wine Weekend held at the Village at Northstar is a chance to discover new wineries and sample their latest vintage or newest varietal. Paired with gourmet delights from Tahoe’s newest restaurants and most exquisite caterers, you’ll want to put this on your calendar for September 2010. Life is short, eat dessert first. That’s why I want to jump right into my adoration for Deerfield Ranch Winery’s 2005 Gold, which is a Select Late Harvest Sauvignon Blanc. Their literature calls it “Nectar of the Gods,” and I have to agree. The winery is located in the heart of Sonoma Valley. This wine is made from Santa Barbara grapes from the Lucas & Lewellen Vineyards in Los Alamos Valley. This is a scrumptious dessert wine, with a beautiful golden hue, aroma of ripe apricots, dried peaches, tropical flowers. The taste is divine, not overly sweet but rich. Only 583 cases made, and it only is sold in a 375 ml size. 12.5% alcohol. $50/bottle. The Salvestrin Retaggio, a “Super Tuscan” blend is comprised of 45% Sangiovese, 30% merlot, 20% Cabernet Sauvignon, and 5% Petit Syrah. It’s a dark purple wine, with aroma of blackberry, currant, spice. The taste carries through the aroma notes, with a well-balanced fruit quality a bit of oak, pepper, earth. Reviewer and critics, The Wine Spies, notes that “present here is that classic subtle orange zest spiciness that you only find in exceptional Italian wines”. The finish is long and dry. This wine is made by this St. Helena, CA, winery as a tribute to the family’s legacy in the wine business, explained third-generation winemaker Rich Salvestin. Rataggio means “legacy” in Italian. The winery makes only 3600 cases total, and only 800 cases of the Rattaggio. 14.8% alcohol. $34/ bottle. Robert Stemmler’s 2006 Pinot Noir, Russian River, from the Nugent Vineyard, has aroma of blackberry, cherry and a taste of blackberry, cherry, chocolate and a nice minerality too. A silky texture, with nice rich tannins. It takes a while to open up, but has a long and sweet finish. 14.1% alcohol. $40/ bottle. Oliver Hill Wines poured their 2006 Pinot Noir, Oakville. Nice balanced, with a taste of tart cherry, and a bit different of a Pinot Noir – I liked it a lot. Aged 24 months in French oak gave a nice structure with hints of raspberry too. Their vineyard, according to owner/winemaker Jerry Hill, backs up to the river just north of Yountville, and this gives a cooling affect to the vineyard very evening, resulting in a pinot grape with a uniqueness. Of 450 cases total production at Oliver Hill, only 63 cases of this pinot were produced. 14.9% alcohol, $20/bottle. Gruet’s 2002 Grand Rose is a wine that hails from New Mexico, and the vineyard is said to be one of the oldest vineyards in the US. This is a Brute Methode Champenoise. In color, it is a beautiful salmon pink. The floral aroma has hints of cherry, apple, almond. In taste, the Pinot Noir grapes dominate the flavor, by the 90% Chardonnay gives this Brut a wonderful finesse. This is a limited production wine, of 280 cases. 12% alcohol. $32/bottle. The Autumn Food & Wine Weekend is held at the Village at NorthStar each September. For more information on dining and the wide range of activities around Lake Tahoe, see the online version of The Tahoe Weekly. This article appeared in my column "It's Grape" in October 2009.